What I love about London is the combination of old and new where you can combine the tradition, pomp and circumstance with cutting edge fashion, culture and technology. Window shopping in London's West End pulls together architecture of the early 1800s and the styles of today. We plan to spend a couple of hours just looking and taking a mile walk (1.6 kilometers) starting at the Burlington Arcade, heading over to Piccadilly Circus and Lillywhites. We then end up at Liberty department store. The Burlington Arcade would be considered the precursor to the modern mall. Wikipedia says it was built "for the sale of jewelry and fancy articles of fashionable demand, for the gratification of the public." 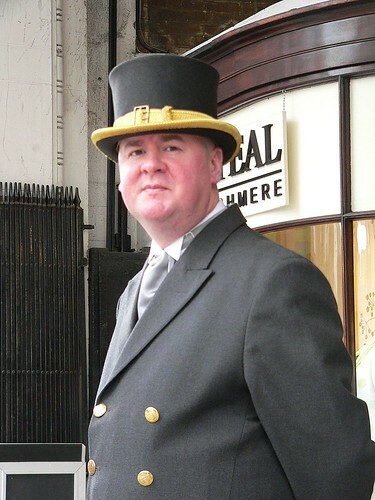 As you enter this arcade you will like be greeted by a Beadle, or an usher at the entrance, complete in top hat. This walkway will bring you past some spectacular windows of some very high end and interesting stores. 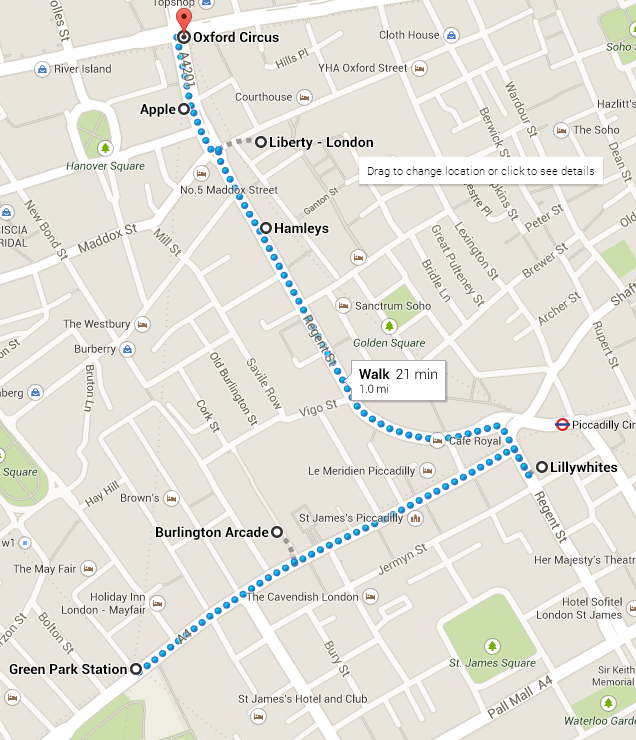 Start out on the north side of Burlington Arcade and walk south to Piccadilly. As you come out turn left and head down to Piccadilly Circus. 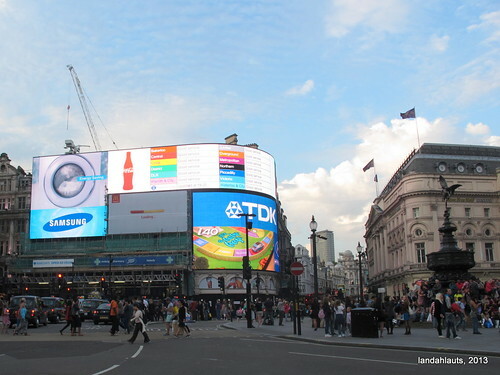 Piccadilly has similarities to Times Square in New York, as it has neon lights, advertisements and the like. There is also the fountain and statue of Eros. Directly fronting Piccadilly Circus is Lillywhites. This sporting goods store, and common London tourist attraction, has been here since 1925. Wander around to see sporting gear and team memorabilia for soccer, rugby, cricket and other sports common to England. Afterwards work your way out on to Regent Street and head north. Regent Street has a little something for everyone. You may be interested in Hamley's Toys, a monster seven story toy store. Maybe a gigantic Apple Store is more up your alley. Or perhaps unique food is of interest to you. You will want to visit the East India Company. There is also an abundance of stores that may be in your neighborhood - Nike, Levi's, Bose and Tommy Hilfiger. We want to end up at Liberty's department Store. Housed just off of Regent St, in a large Tudor facade building, Liberty sells unique gifts, novelties, clothes, and home-wares. You may want to stop in just to get a scone with clotted cream and jam at the Liberty Cafe on the 2nd floor. Or simply that you need to go and that AllinLondon.com ranked the ground floor bathroom in the shoe department as "second to none". London Transport flanks the beginning and end points of this shopping route. Oxford Circus is the fourth busiest Underground station in the system. It is serviced by the Central, Victoria and Bakerloo lines. The other side is Piccadilly Circus, with the Piccadilly and Bakerloo lines, not to mention 16 bus routes that pass through. You can also use Green Park with the Victoria, Piccadilly and Jubilee lines. If you are using Barclay Bikes, there is a station just to the north and east of Burlington Arcade on Sackville Street and another between Liberty and Oxford Circus station. Going on a family vacation builds memories, provides life changing experiences and helps teach about the world we live in. Take time to explore, enjoy and have fun. If this tour Regents Street sounded interesting, you may also like Fat Tire Bike Tours. You can also look at our entire list of London Attractions.